While staying in the Carpathians with our friends Anca and Eduard, we had a lot of conversations about jam. I don’t possibly have space here to tell you about everything we learnt (although I’m sure Anna will try soon) – but here’s two things. First, Romanians have a lot of words for jam. Second, two of them, dulceață and șerbet, are things we don’t really have in the UK, involving interesting ingredients like green walnut and aubergine, and mysterious old social rituals involving teaspoons and glasses of water. It’s often tempting to try to make what you see fit with what you already know. So, given what we already knew about Ottoman influence on Eastern European cuisine, we quickly jumped to the conclusion that this must be a Turkish phenomenon – șerbet is a Turkish word, after all. 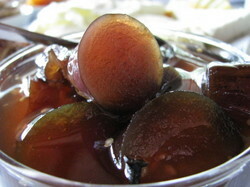 And when we reached Turkey, we did indeed find delicious walnut and aubergine jams. Looking back at the pages of notes we took from a quick chat with Anca, we seem to have identified no fewer than seven different kinds of Romanian “jam”, each with its own word, most of which seem to come from different roots. 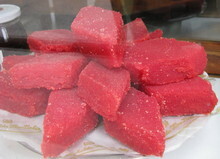 There’s a clear set (but pectin-free) jelly called pelte (from a Turkish word); a thick opaque paste made of rosehips called pasta (from Latin roots); marmelada (from the Portuguese), a thick fruity paste containing apple or quince for their pectin; magiun, a very thick plum paste (also from Turkish); and gem, from the English, er, “jam” (and, like that, a sort of mush of fruity bits). We even got to try most of them, and they were all lovely. Things got more interesting with dulceaţă, though – partly as Eduard makes his own quince version, by preparing little strips of quince and boiling them in syrup (it’s a bit more complicated than that, of course, but you get the basic idea). It’s an old traditional method, and used to be made with ingredients that we’d consider strange now – green walnuts, aubergines and tomatoes. 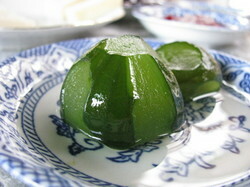 But whatever you use, the point is to end up with something made of clear, runny syrup with whole intact fruit pieces. The look of the dulceaţă therefore becomes almost as important as the taste, and in days gone by, this said something about the household which produced it. When guests came to visit, you might serve them little bowls or spoonfuls of dulceaţă which they would admire and eat on their own (possibly with coffee, but not spread on bread or anything which would detract from their perfection). Anna’s anthropologist antennae were twitching. But then there is (or rather was) şerbet. This had a similar social function, being served to respected guests; but looked quite different, being a thick, opaque, flavoured fondant sugar – so thick that it was served on a teaspoon, always with a glass of water to dip it in. But we couldn’t actually see any or try any, because nobody actually does this in Romania any more. Perhaps we’d find some in Turkey? It’s clearly a Turkish word, so we (and Anca) thought it must be a Turkish tradition. We could hardly wait. And when we got to Turkey, things started promisingly: we quite quickly came across what seemed to be dulceaţă by another name – tatlı. And very excitingly, we even found the old-fashioned versions: at Çiya and Zeliş Çiftliği we found aubergine, green walnut and tomato! That wasn’t all – we also found a beautiful fig version and (our favourite) a delicious one made from pumpkin, kabak tatlısı. But could we find şerbet? Well, actually, yes – but it wasn’t the same thing at all. Şerbet is certainly a Turkish word (it’s where we get our English “sherbet” from), and a Turkish recipe, but it’s a sweet flavoured drink (we tried spring herb, cinnamon, licorice and sumac versions among others) rather than a spoonful of paste. You might prepare a paste from which to make your şerbet – like the blocks we saw for sale at Hacı Bekir in Istanbul – but you wouldn’t serve it like that. And come to think of it, if dulceaţă was really a Turkish import, why didn’t the Romanians use a Turkish word for it? As with most Romanian words, dulceață clearly comes from Latin roots, in this case dulcis, meaning sweet. Confused, we gave up and left for Greece. But here, sitting in a Thessaloniki café and bemoaning our inability to crack the dulceață question, we noticed a sweet called υποβρίχιο – pronounced “ypovrihio”, and meaning “submarine“. To mounting excitement, we discovered that this consists of a spoonful of sweet opaque fondant paste, flavoured with either vanilla or mastic – a kind of pine resin from the island of Chios. And get this – you eat it by dipping it in a glass of water. Could this in fact be the şerbet we’d been searching for? Encouraged, we turned our jam-spotting senses back on, and immediately realised that they had dulceață here too, even though they had cunningly disguised it with the name γλύκα κουταλιού – “glyka koutaliou”, or “spoon sweet”. (Like dulcis in Latin, γλύκα is Greek for “sweet”, and is where we get English words like “glucose” and “glycerin”). 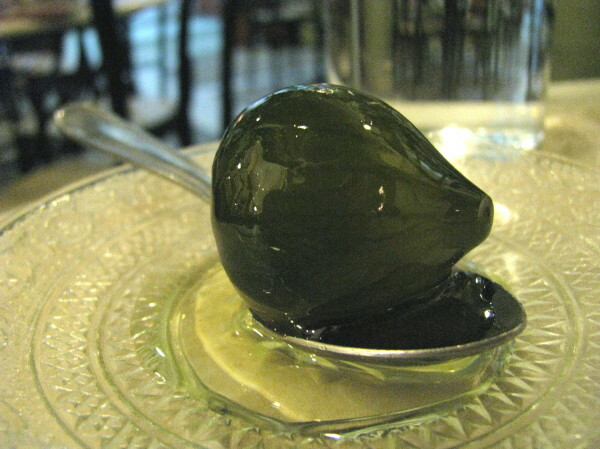 Not only did they have it, they still ate it out of teaspoons: go into a kafenion or an ouzeri (the kind of cafés and ouzo bars frequented by old men) and you’ll still come across spoon sweets, and they’ll be served (surprise!) 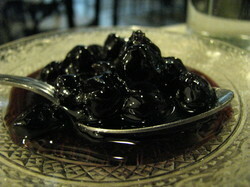 as complete pieces of syrupy fruit, on a spoon. So were these Greek things after all? If so, how did they get to Romania? And why would Romanians have ended up using a Turkish word for şerbet? Well, as soon as we started thinking about this – well, OK, as soon as we asked Güzin Yalın and Bike Kocaoğlu about it (at the Eastern Mediterranean food conference we attended in Crete) – the answer became obvious. Basically, we’d forgotten that the Ottoman Empire wasn’t really entirely Turkish. In fact, in some aspects, it really wasn’t very Turkish at all. n sweets were big in Greece, this meant they were big in Constantinople, which had of course been the major city of the Greek-speaking Byzantine empire, and kept a very large Greek population after the Ottomans made it their capital. (Particularly so in the neighbourhood of Fener, which stayed quite Greek even after it became Istanbul, up until the 1950s). On its own, this might have been enough to take spoon sweets to the outskirts of the empire, including Romania. And if submarines came too, using a Turkish word like şerbet to describe them kind of makes sense, as they’re similar to Turkish şerbet to some extent. But here’s what really convinced us – the people the Ottomans sent to Romania generally weren’t Turks at all. Not wishing to upset Europeans with direct Turkish rule (they weren’t actually officially in charge in Romania – its various parts were usually nominally independent states, although the “nominally” is important), they usually sent Phanariots instead. And Phanariots, of course, (named after the district of Fener) were the spoon-sweet-eating, submarine-sucking Greeks of Constantinople. So here’s how it works: the Greeks liked eating things out of teaspoons, both fruity spoon sweets and fondanty submarines. They did this in Constantinople, where they lived – leaving the Turks with the fruity tatlı habit (just as with Greek γλύκα and Latin dulcis, tatlı just means “sweet”). And they took it with them to Romania (and other parts of the Balkans) when they went to govern them as Ottoman officials – leaving fruity dulceață, fondanty (if misnamed) şerbet, and the tradition of presenting them on spoons. So next time you’re in a Greek ouzo bar, order a submarine – and you’ll be carrying on a tradition that spread all the way to Transylvania. For example, various Romanian dulceață, including rose petal and green walnut, are now available in the UK thanks to the Fundaƫia Adept, who can also help you discover the culture, crafts and countryside of Transylvania yourself. For the delicious and unusual jams, which are Slow Food Presidia products, try Cairn Foods in Scotland or Patisserie Româna in England. Greeks have been living on the land north of Danube even before Romans came there. Tomis (Tomi) was a Greek colony along Pontus Euxinus (Black Sea) founded around 600 BC, the modern day Constanta. 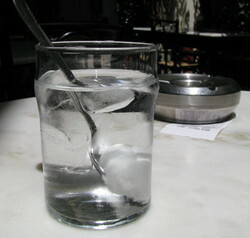 It is not inconceivable that the Greeks brought in the custom of chewing mastic, which was also served in water, many times flavoured water (orange, rose) for special guests. Even before the Ottoman Empire Turks travelled and settled into that area – maybe they tasted the flavoured water soaked mastic, and for sure reminded them of their sherbet (sharbat) drink. In the unbelievable crucible that that part of the world is, words were easily borrowed from one minority to another and to the majority. I also know why you couldn’t find serbet in Romania nowadays – that was a product mostly available before 1989 and most of the people used to buy it, it was easier to do that than have it homemade and because the stores stocked an incredible variety. It would have been like the Italians making gelato at home when they have such wonderful gelato parlours everywhere. Anyway, you are right, the serbet is a fondant like paste in dozens of flavours, packed in jars that don’t need refrigeration after opening. Hi Elena – Buna Ziua! Thanks so much for your really useful and interesting comment. I take it you are Romanian – ? Have you studied food history? The list of jam types is really helpful. We had some of this in our heads and other bits in scribbled notes, so this is a great round-up. Matt seems to have got it largely right! I make quite a few dulceatas – pumpkin, strawberry, rhubarb, cherry – and want to try more. I really want to try the green walnut preserve which I’ve had in Romania, Greece and Turkey – it’s been identical everywhere. I was even given some by the Greek owner of the egg ‘n’ chips cafe round the corner from my house in north London! Please do send serbet recipes… Thank you! I am interested in the early Greek presence you talk about. I wonder a) if there is proof of continuity in the mastic/’sherbet’/’submarine’ tradition from then until modern times, in what is now modern Greece and in what is now Romania? There was surely a large gap of many centuries between those early Greeks leaving the Black Sea area and the Ottoman Greeks arriving? As you say, it may have started with a Greek name and then taken on the Turkish name later when the Ottomans arrived. Or perhaps the tradition died and came back? And b) did the ‘spoon sweet’/dulceata/glyka/tatli tradition go hand in hand with the serbet one and also arrive in the Black Sea area in ancient times, presumably then made with honey and/or reduced fruit syrup (like pekmez in Turkey)? Or is this a distinct and more recent culinary tradition? Thank you again for your insights. A shame I never went to Romania when the serbet shops were around! As regards the etimology of the word dulceata, why must you assume it came from the Greeks or the Turks? We have a lot of fruit trees and are an old European people, it is reasonable to expect we were preserving the fruits in sugar. The Phanariots came to our country during the 17th century, we were preserving fruits before that! As regards the Greek colonies, they were only on the Black Sea coast. Maybe we borrowed things like the dulceata from rose petals, but there are types like those made from sour cherries and from bitter cherries that I have not seen elsewhere. 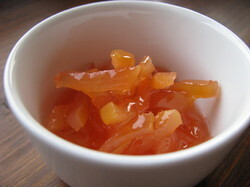 Do try them, bitter cherry preserves are not easily found, but are a real delicacy! thank you! Yes I quite agree, surely people in Romania (like people everywhere) must have been preserving fruit (and other things) for a very long time. And the etymology of the word dulceaţă must surely be Latin (dulcis=sweet), which must suggest it’s been around for a while! 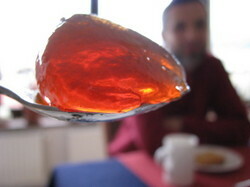 We were just struck by how different dulceaţă is, with its clear syrup and whole pieces of fruit, from the jam we’ve generally found all around Europe – and how similar it is to things we found in Greece and Turkey. And how nice it is!